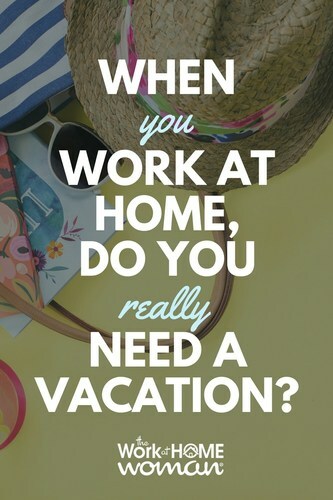 When You Work at Home, Do You Really Need a Vacation? You are here: Home / Work at Home / When You Work-at-Home, Do You Really Need a Vacation? Whether self-employed or working for someone else, those of us who can work from home realize we are incredibly blessed. As work-at-home women, we get to enjoy many wonderful perks, like being able to throw a load of laundry into the wash in between conference calls or relishing our 30-second “commutes” and “casual” wardrobes. But there are some challenging realities that come with working from home as well. One of the things I struggle with in today’s highly connected, technological, topsy-turvy, contemporary virtual “workplace” is my hesitancy to unplug for a little while. This is especially true when it comes to official vacation time. I mean, as a work-at-home woman, I already enjoy considerable work/life balance. So, are legitimate vacation days really that important? Apparently, they weren’t because, this past year, I forfeited eight vacation days. That’s right. E.I.G.H.T. days! When my HR Team made me aware of this fact, I stopped and reflected on it. How and why did I let this happen? What do I need to do to make some changes in this area of my professional life? For today’s post, I’ve decided to examine my top 8 reasons for passing on my vacation time (one for each day I forfeited). 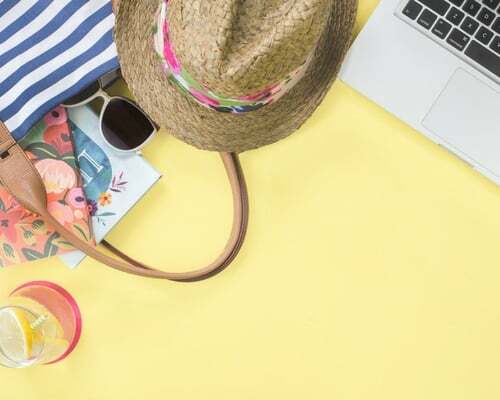 At the conclusion of this post, I think you'll be able to answer the question: when you work-at-home, do you really need a vacation? — with a resounding, yes! This is my top excuse for not taking vacation time. I have some tasks or clients I manage on my own, and in my estimation, it would involve a ton of work ahead of my vacation and a ton of work afterward to keep things moving … so why bother? The fact of the matter is, whether you are an entrepreneur or work for someone else, this is a TERRIBLE business model to have. If there is no one else that can be a back up to you, what would happen to the business if some emergency came up and you HAD to be away? It just makes sense to take a little time and bring someone else up to speed on what you are doing. You can motivate them by offering to do the same when they take time off. In today’s economy, workers are usually doing the work of 1 ½ to 2 people. People feel as if they have to bring as much value as possible to their work to keep their jobs or customers. But, if we don’t stop to take any time off, we are more likely to burn out and may find ourselves disengaged from our businesses and bitter toward our employer and customers. And I happen to think that our bosses and customers appreciate and respect us in the long run if we do what we can to preserve our passion, creativity and mental and physical health. Like the points above, there have been sometimes when I’ve wondered if the cons of taking time off outweighed the pros. But, I think I was minimizing the physical benefits of resting and relaxing. There are mental gains to be had, too. If we rest and recharge, and allow ourselves time just to think vs. be drawn into the tactical day-to-day of our work, we are more likely to find inspiration or a fresh perspective. Plus, we haven’t even touched on the benefits of taking some time to maintain and nurture the relationships that are so important to us (the reason many of us choose to work at home in the first place). As the saying goes “Failure to Plan is Like Planning To Fail.” The problem with this mindset was that I would quickly forget about my time off until it was too late. I’ve combated this by pulling out my calendar, my kids’ school calendars, the holiday schedules, etc. and putting something on the books now. If something does come up, I can always reallocate the days off I had planned for later in the year. I was not alone with my concerns about spending money on a costly vacation. Many other American workers opted to forfeit time off and focus instead on paying down debt or cutting expenses. But with a little pre-planning and creativity, I could have still experienced some adventures and spent very little money or nothing at all. A small picnic at the park, walk on a local nature trail, or a road trip to a nearby point of interest would have done the trick just as well as an elaborate, expensive vacation. After almost 15 years of service with my company, and a generous time off allotment, I have often looked at the total time I am entitled to and wondered, “Do I really need that many days off?” The interesting thing is compared to citizen’s in other developed countries; American’s do not take as much time off. According to a report released by the World Tourism Organization, (and reported on CNN World), the average Italian worker enjoys the most vacation days with 42 days off. This is followed by France with 37 days, Germany with 35, Brazil with 34, the United Kingdom with 28, Canada with 26 and Korea and Japan both with 25. The United States was pulling up the rear with the average worker getting 13 days off. So … we work more. Isn’t that the American Way? We’ve always worked pretty hard, and it has paid off, right? Well, we have worn our Puritanical work ethic like a badge of honor. Economists say growth in America is not necessarily reflective of our work schedules, anyway, but is tied instead to education, productivity, immigration, and investment. And many experts insist that a worker’s productivity significantly declines when they fail to take a break to rest and recharge. In many places across the country, Spring has sprung. If you haven’t already, I challenge you to get your calendar out and commit to some time off. And then go ahead and take it. Unplug your phone, stay off the email, and proudly spend your time resting, relaxing, and reconnecting with those around you. When your subconscious flares up and tries to tell you not to enjoy that time away, remind yourself that your mental health, emotional stability, creativity, passion, relationships, and colleagues, and customers NEED you to take some time to recharge. What do you think? Do you really need a vacation, when you work-at-home? What challenges do you face when you consider taking time off? How do you overcome them? What reasons did you use to neglect your much-needed R&R time? Drop us a note we'd love to hear from you! Christy Schutz, is the author & creator of Higher Calling Communications, which is committed to helping you make the most of your calling! She’s putting 16+ years of experience in the advertising, recruitment, employee communications, marketing & special events industries to good use by helping individuals, businesses & faith-based ministries discover, develop & market their own distinct calling or mission. She also helps people leverage communications strategies that will enable them to build deeper, more effective relationships with those they hope to serve. This Tampa Bay, FL-based Mom also keeps herself busy by raising 4 kids, caring for her husband & doting on her cute Jack Russell Terrier, Petey! Very true, Christy. Even in India, we are required to be totally workaholic. Bosses rarely allow anyone to go on long vacations without a genuine reason. Even during the vacations, we are expected to give replies to office queries via our mobile or laptop. Prasanna – I think more and more companies here in the US are equipping their employees with smart phones, so that they can check in while they are “on vacation”. I don’t agree with this, I think your off time, should be totally free from work distractions. We all need time off to disconnect and recharge. I publish the virtual fashion & lifestyle magazine, VERTICAL Tampa Bay. Twice per year, I unplug for two whole weeks. Highly recommend it. This is SOOOO true. It is hard to put parameters on anything when you work from home. It is easy to find reasons, or excuses for not taking a vacation when you are your own boss and/or your clients dictate your work. As much as I love my job, I love traveling equally as much, so I don’t have a problem taking vacations. I did have to hire a VA to watch over things while I’m away, but it’s a small price to pay for peace of mind when I’m getting some R&R.